Apple showed off a lot of new stuff today, so much so that it’s actually hard to process. But from a macro perspective, one thing is clear: iOS 8 actually represents much more of a shift than did iOS 7 last year, despite the fact that the visual changes in iOS 7 threw users and Apple-watchers for a loop. As a result, iOS 8 faces fewer barriers in terms of broad acceptance and usage – the UI is by now familiar, and the massively changed new features and developer access permissions will be much easier to adapt to since they weren’t delivered alongside a startling new look and feel. But where the metaphorical plates of iOS’s programming pillars meet, there’s a tectonic shift that could change entirely the way people think about their mobile devices – and computers in general, for that matter. The mobile shift is going to be tremendous because of the new freedom afforded developers with the Extensions paradigm, which allows them to build hooks between apps that approximate desktop-level flexibility while keeping the simplicity of the mobile UX for the consumer. And notification widgets make a whole new playground for devs to explore (software in the Notification tray will become more than just add-on features for standalone apps, just you watch). Opening up the keyboard to third-party providers for system-wide installation is also a huge step for a company that has traditionally shied away from such things. But Continuity is the component to watch in all of this, and the reason we may not be thinking about the silos of mobile and desktop so distinctly from now on. It’s open to third-party devs, in addition to being built into Apple’s own native apps and services. It can work either by pairing devices that share a Wi-Fi network, or based on proximity of devices using Bluetooth cues (and in Bluetooth range). Combined with other Continuity features, like SMS and phone calling on the desktop, it makes for an experience that blends mobile and desktop seamlessly where it makes sense, while avoiding a weird and unnecessary forced melding of the two (which is arguably what Microsoft managed with Windows 8). 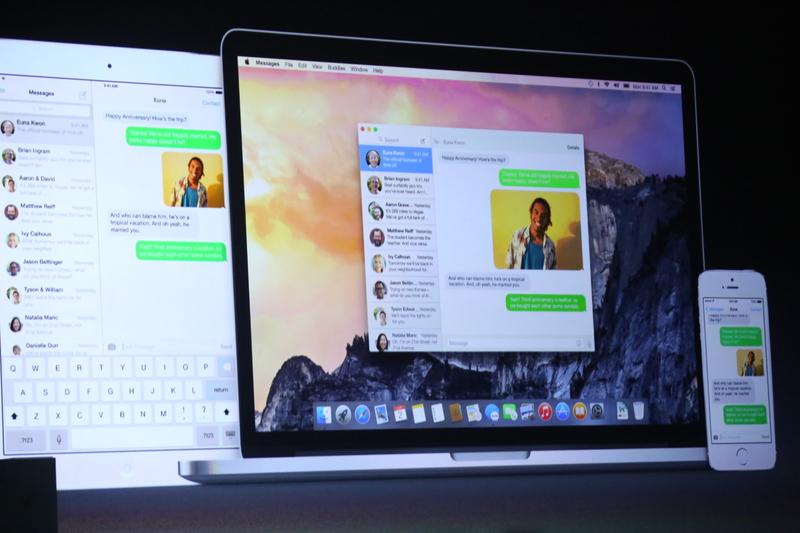 iOS 8 and OS X Yosemite will change the way you use your smartphone, and it’ll do so in non-trivial ways. That’s more than can be said for any mobile OS update in recent memory, and something that we’ll be feeling of the impact from not only this fall, but likely for years to come.